The Dell V313 printer is an excellent choice to an all in one. This is used to scan, copy and print. It has a good looking design. Dell V313 all in one offers good quality of prints and outputs and also offers fast print speed in both black & white and color. It can prints up to 33 (ppm) black & white pages and up to 30 (ppm) color pages in a minute with 4800 x 1200 dpi resolution. This is a wireless printer. This Dell V313 all in one delivers high quality and high productivity printing. This is user-friendly and easy to use the printer. You can easily setup this Dell V313 all in one inkjet printer. You can easily download latest driver & software packages for this printer with a easy click. This printer’s driver and software packages are compatible with Microsoft windows XP, windows vista, windows 7 and Windows 8. Dell V313 Driver for Windows server 2000, 2003, 2008, 2012 and Linux – Not Available operating systems drivers are not available even on DELL official website. Maybe the these drivers are in-built in given operating systems or the printer v313 doesn’t support these operating system, we are not confirming this because Dell official website is also not confirmed this yet as of 12/23/2015. You can download the same drivers directly from Dell 313 official download page. Update: Today we just have tried to update this driver download page with the latest operating systems like; windows 8.1 and windows 10 but when we go to the dell official download page of V313 printer, that page stated that: “Dell has not confirmed that this printer model and/or its features work with devices running the Windows 10 operating system” – So in this case we recommend you to please use windows 8 driver for windows 8.1 and windows 10 operating system. Update2: Added Dell v313 official download page link. Added dell 313 windows 8.1 and windows 10 drivers into the download list. You have to install these drivers in compatibility mode in windows 8 and 10. go to above download section to download the dell 313 windows 10 driver. Question: Requesting Dell v313 Windows 10 - 64bit driver and software, please. Answer: Dell v313 Windows 8 driver also works with Windows 10 operating system. 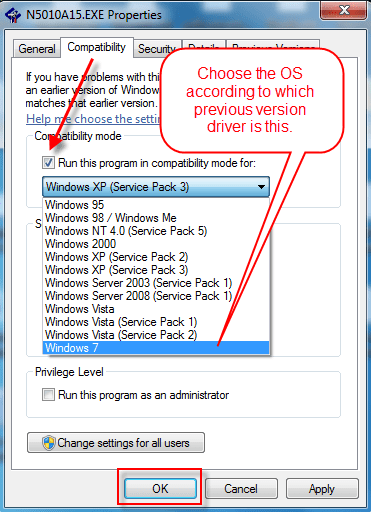 So please install v313 windows 8 x86 driver on windows 10 computer using compatibility mode. In the properties window, go to the compatibility tab and then make a tick mark the check-box "Run this program in compatibility mode for"
Finally, click on the Apply and OK button. Please see the screenshot below. Question: Hullo, Please could you let me know if DellV313w printer software is available for MacBook Air? Thank you. Answer: Click here to download the Dell V313w driver for Mac OS. Question: Is it possible to install Dell v313 printer, or connect one, to my tablet, a Kindle 10hd, if so how or is there a printer that is compatible with Kindle tables? Answer: It is possible if a Dell printer app is available on the Amazon App Store. Please check out the Amazon appstore for Dell app. I have it on my laptop, however i need to install it into my desktop. Thanks alot for this. I really need v313 drivers, thanks for that link. Hi I have just purchased a Dell V313w on E Bay it came with no installation disc, how do I then install this item to my PC. how to download this driver? All the drivers download link listed on this page. Please check that again and let us know if do not found. Any down loads for MacBook pro? please let me know asap… thank you! I have ungraded to Windows !0 and love it however…. my Dell V313 printer no longer works. What can I do? – Uninstall the older version printer drivers and then download and install the windows 8 driver on this windows 10 computer, it should work for you because windows 10 based on windows 8. Use windows 8 drivers on windows 8.1 or windows 10 because Dell has not provided its driver for windows 8.1 or win 10 OS yet.